DoPT comment: As per the ToR of the NAC, anomalies are basically pay-centric. Under this point, the contention of the Staff-Side is pension-centric. Furthermore, the Staff- Side has themselves clarified that post-7th CPC, Government had set up a CoS headed by Secretary(Pension) to look into the first option recommended by the 7th CPC. Eventually, this was not found feasible to be implemented. With such a decision having been taken at the CoS level, it cannot be called an anomaly. 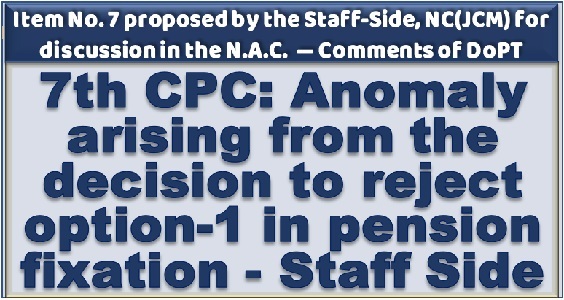 In view of this, we may inform the Staff-Side to separately take it up with D/o Pension without treating it as an anomaly that can be taken up at the NAC.